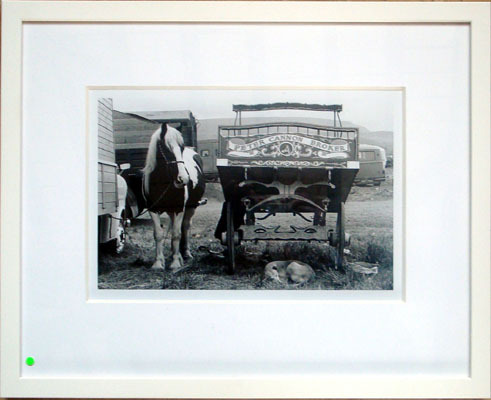 Original limited edition photographs of the Appleby Horse Fair by the highly respected documentary photographer. Dave Thomas was educated at Glasgow School of Art and then took an MA in Film studies at the University of Sunderland. He has exhibited widely, particularly with Northern Arts, Yorkshire Arts, and recently at the Newcastle Playhouse. 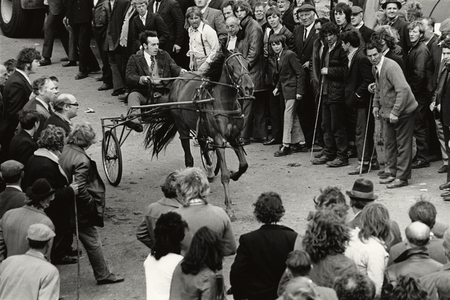 The photographs displayed are from his documentation of the annual gathering in the North of England of travellers and others involved in horse culture, developed over the fairs that took place in 1969 and 1970. He writes: The Romany horse fair at Appleby is the largest and most important in the history of travellers’ gatherings in England, dating back to 1685, when James II granted a charter granting the right to hold one there, on a site ‘near to the River Eden’. Since that time, in the month of June, travellers have converged on Appleby, not just from England, but from Scotland, Wales and Ireland too. They gather in caravans and vardos on Fair Hill, to celebrate their history, music, folklore and family relationships, but most importantly to trade and barter in livestock. The relationship with the townspeople of Appleby has always been ambiguous. On the one hand the travellers are welcomed for the commercial revenue they bring, on the other they are regarded as some sort of alien invasion. The meeting grounds between settled and nomadic cultures have often provided points of friction, but contemporary materialism seems to heighten the sense of dislocation. The love of hunting, the closeness to nature, the breeding of horses and dogs also form part of a rich tradition that seems increasingly alienated from mainstream culture.